I recently met and spent time talking to a new business owner in the Milwaukee area, John Gill, who sells a product that many winemakers will undoubtedly find interesting: used oak wine barrels. As the scientific reality of global warming sinks in, an ever-growing number of companies are doing their part to become more environmentally responsible. Being green is the driving philosophy behind John Gill’s four-year-old business venture of buying previously used oak wine and ‘spirit” barrels and reselling them for continued use in activities as varied as gardening, decorating, furniture making, brewing, and winemaking. John’s desire to create businesses with a small environmental footprint goes back further than his current used-barrel business. Born and raised in Northern California, John was immersed in an area of the country that was at the forefront of the green movement. In 2001, armed with his degree in Resort & Lodging Management from California State University at Chico and inspired by already-existing green businesses in the San Francisco Bay area, John started a small private tour business, ‘Escape San Francisco Tours,” which offered active vacations in the Sonoma area of Northern California. Although Escape Travel thrived for a while, the 2008 recession contributed to a sharp reduction in corporate-sponsored tours and, at the same time, the tour business industry became much more competitive. With a 15-person van, cargo trailer, and storage area that were often unused due to the business slowdown, John decided to explore additional environmentally responsible ventures. Since 2009, the Barrel Broker has sold over 10,00o used wine barrels to wine, beer and spirit makers as well as for planters and other landscape uses. Based on his conversations with many winemakers and cellar masters, in March 2009, John bought some used barrels from Robert Mondavi Winery in Napa Valley and soon sold them as garden planters. 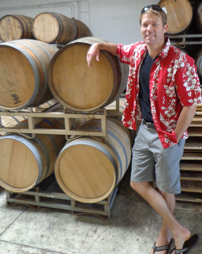 Within a few months, as small wineries began contacting John requesting barrel racks and good-quality used barrels for winemaking, his new business, The Barrel Broker, was born. The used barrels he now sells come from coopers throughout the world, including Seguin Moreau, Francois Feres, Demptos, Boutes, Taransaud, and World Cooperage. Right from the start, John’s barrel business was a committed green recycling company, working to reuse oak barrels, barrel racks, silicon/wood bungs and other used wine barrel accessories to help ensure the future sustainability of oak forests. Most quality used barrels have a wine making/aging life of about 8-9 years. The Barrel Broker also began selling barrel staves, barrel heads, wine-soaked oak for grilling/smoking, and even the metal bands of the barrel; when not used whole, every single part of the barrel was recycled and reused in some fashion. At first, John sold barrels mostly to wineries and breweries, but he then realized that whiskey and bourbon makers were also seeking to oak their liquor. That’s when he began buying and trading for used whiskey or ‘spirit” barrels. Many of these spirit barrels were 59 gallons, but there were also plenty of 5-gallon, 15-gallon, and 30-gallon barrels that had previously held, gin, whiskey, or bourbon. Wine barrels and spirit barrels are often made from the same types of oak and with the same barrel design; where they may differ is in whether their insides are either slowly toasted or more quickly charred. The insides of oak wine barrels are typically slowly fire heated to various light, medium, or heavy toast levels, infusing the wine that is later aged within it with such aromas and flavors as vanilla, coffee, and roasted nut. In contrast, the insides of oak spirit barrels are generally more quickly and intensely fire heated so that the wood is actually charred to one of four or five levels of intensity, imparting the liquor inside with such tastes and aromas as burnt toast, vanilla, and caramel, as well as tinting it with different shades of brown coloring. During the years that John was developing his touring business, he met and married Kathleen, an investment broker who had grown up in the Milwaukee area but was now living and working in the Bay Area. With the arrival of both a son and a daughter, John and Kathleen began developing their domestic skills. Given Kathleen’s relatively inflexible work hours as a corporate executive, John learned how to adeptly juggle his dual roles of entrepreneur and stay-at-home Dad. Last year when Kathleen had a career opportunity with Franklin Templeton Investments to move back to the Milwaukee area, the family decided to pull up roots and build a new life in the Midwest. 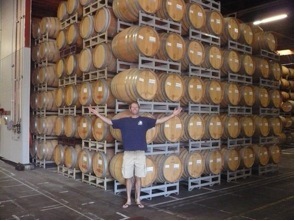 In June of 2012, John arrived in Milwaukee with 230 barrels and eight wine racks, setting up his business in Brown Deer. Twelve months later, John has moved The Barrel Broker to a considerably larger and nicer 5,000 square foot facility in Mequon. During the first part of 2013, The Barrel Broker’s Milwaukee-area sales accounted for about 20 percent of its business, with the remaining 80 percent being largely Internet-based sales to wineries, breweries, and distilleries outside the Greater Milwaukee Metropolitan Area. Later this year, Lakefront Brewery will release its annual Pumpkin Lager that has been aged in 120 barrels supplied by The Barrel Broker. In the future, John would like to increase the volume of his Milwaukee-area sales, partly by selling to amateur winemakers and brewers. Prior to buying and selling used oak wine barrels, John was a wine drinker but not a wine maker. However, his mother and stepfather live in a Sierra Hills gated community of 88 Mediterranean-style homes in Loomis, California, called Clos du Lac, which is a French idiom meaning ‘walled vineyard by the lake.” In Clos du Lac, each homeowner’s half-acre lot is planted with Petite Sirah, Cabernet Franc, Petit Verdot, or Mouvedre grapevines owned and maintained by the neighborhood homeowners’ association. Each fall, these grapes are harvested and made into wine by the homeowners or local wineries, including John’s parents, often with the help and guidance of experienced winemakers. The grapes are also sold for $1,200-$1,500 per ton to home winemakers, depending on the age and location of the vines. Starting in 2007, John began making wine at his parents’ house from grapes grown in the Clos du Lac Vineyard. I have tasted a bottle of John’s 2011 Petite Sirah and it has an excellent fruit-forward aroma, with a wonderful initial blackberry taste that is followed by a strong aftertaste of leathery tannins; this full-bodied red will undoubtedly age very well in the bottle for years. Now that John and his family have relocated 3,000 miles away from his Clos du Lac grape source, he is seeking fellow Milwaukee-area winemakers who might be interested in teaming up to purchase and ferment good-quality grapes to age in one or two of his 59-gallon oak barrels. 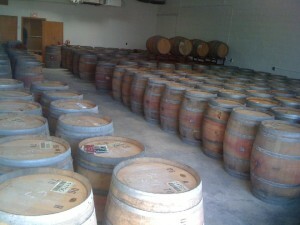 The Barrel Broker sells American, French, and Hungarian oak wine barrels that previously held either red or white wines. Typically, these barrels have been used for wine aging between three to six times over a five to seven year period. Because these barrels come from wineries, they are almost always in the 59-gallon or 60-gallon sizes, but some are 70 gallons. The most common barrel size is the Bordeaux style holding 225 litres (59 gallons), with the Burgundy style barrel holding 228 litres (60 gallons) being next. All of John’s used oak barrels that are five gallons in size have previously held bourbon, gin, or whiskey; he also has a smaller supply of 15-gallon and 30-gallon spirit barrels. After later doing some Internet searching, I discovered that this wedding of used spirit barrels with newly fermented wine is not without precedent. About eight years ago, a group of Australian winemakers decided to try aging some of their most promising Shiraz wine in oak barrels that had previously held Kentucky whiskey, eventually resulting in 1,500 cases of ‘Southern Belle Shiraz” that sold for $25 a bottle. So it appears that aging young wine in used spirit barrels can yield good results wine-wise. To learn more about the Barrel Broker visit their website. Dr. Stephen Franzoi is the editor of the The Vintner’s Press, a publication of the Milwaukee-based Wisconsin Vintners Association. For more information, please see Vintner’s Press Articles on the Milwaukee Vintners Association website. looking for several used wine barrels in decent condition…do you ship? We live in the Nashville, TN area.